Susan B. Anderson: Like. Like. Love. First I have randomly selected 5 winners, each will receive a copy of the Unofficial Downton Abbey Knits magazine! 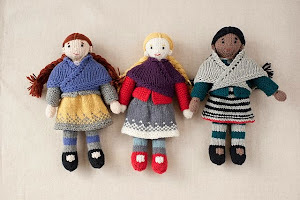 The winners are (by Ravelry ID): Debbie4, VCR, kerryespins, annejz, and Yarnvixen. Congratulations! 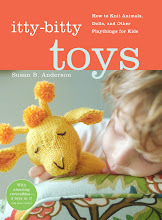 I sent the winners a message through Ravelry with directions on how to receive the prizes. 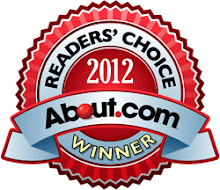 Thank you to all for entering and for F+W Media and Interweave for giving us this opportunity. Now for some knitting! 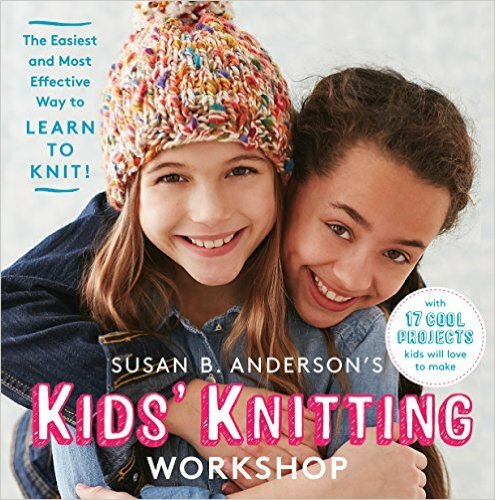 Here are a couple of things I like that involve knitting and my daughters. My girls are both on the high school swim team. The team pairs up an upper-class swimmer with a freshman or sophomore. The pairs become "sisters" for the season. The swim sisters make each other inspirational posters and get weekly gifts for each other amongst other things. It's all fun and good but admittedly a lot of work for me. Each week I try to come up with something fun and little and unique. Some weeks are better than others. 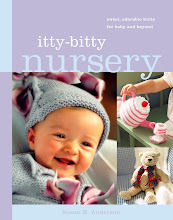 The weeks I am describing here are knitterly and an example of a couple of better weeks. Every year I have knit a hat for the swim sister and a pair of mittens, given on separate weeks. Lion Brand had this super-bulky team spirit yarn at JoAnn's and in the team colors for our swim team. It was the perfect yarn for sister mittens. Go team! These flew off my needles in no time. We debated the pom-poms but I finally couldn't resist. I might write up the recipe for this hat. I used scraps of worsted weight wool held double on US 13s. 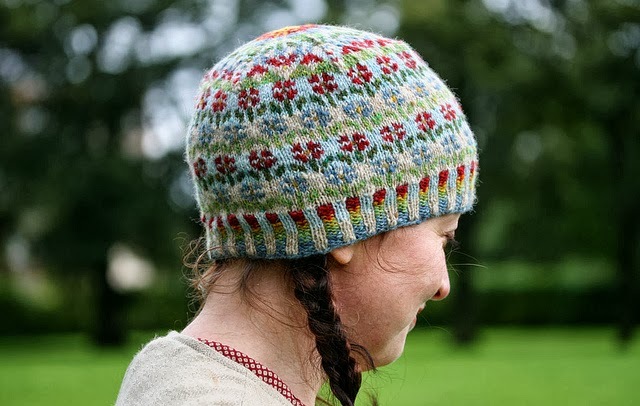 These hats are a fast and fun knit. I made it up as I went along. What a great scrap-buster. The finishing touch included these wool felt labels. I stitched the girls' names with black thread. The labels marked the inside of the back of the hat. The back is hard to tell sometimes with this style of hat so I wanted to be sure to mark it for ease for the girls. It's a cute and personal touch. My buddy and fellow designer Betz White designed some fantastic knit-inspired fabric not too long ago. She has a bunch of it in her home and being the fabulous sewer and bag designer that she is, she decided to create some project bags using her fabrics. I was lucky enough to test out a prototype for her. There was nothing I could offer for improvement after I received my bag. 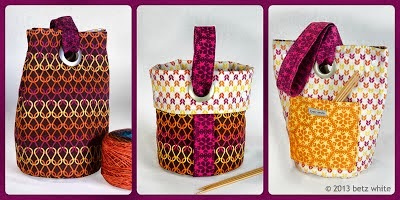 They are adorable and functional as knitting project bags! 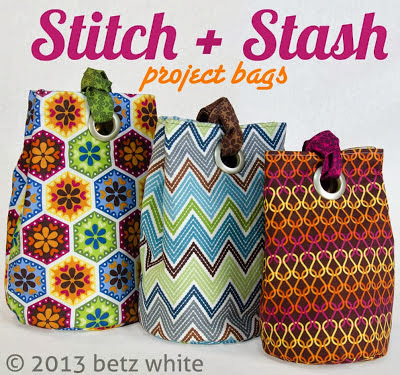 Betz is offering pre-orders for her Stitch + Stash Project Bags right now! The bags are reversible and can be folded down to sit and stay open or they can stay securely closed. The project bags are adorable and unique to boot. Click here for all of the details and/or to pre-order! Click here for Betz' Etsy Shop ~ the bags are here, too! I love my sample bag and I think you will love them as well. Check out this incredibly cute felt ornament pattern by Betz! I am making these for Christmas gifts this year for sure! Now this next shop was brought to my attention through an email from the button creator herself, Hannah Dewey. I checked out her shop and I think it is worth a mention! Hannah makes buttons, hair bows and shawl pins and they are all cute and well-done. I especially like the candy swirl buttons. 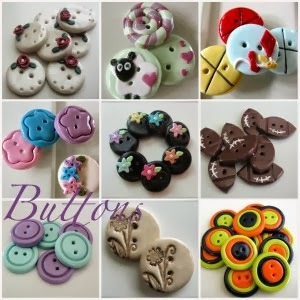 The buttons include whimsical children's designs and more subtle adult-like buttons as well. I haven't ordered any yet but I am planning on it soon. 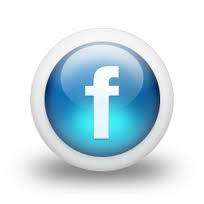 Click here for Hannah's shop, Fastenation Studio! If you order something let me know how it works out. Lastly, I am loving the hat, Peerie Flooers by Kate Davies (one of my favorite designers, click here for her website!). I am going to cast this on. I have been scrounging around and I think I have the yarn to make this in my stash and pretty close to the colors, although slightly different. Isn't it gorgeous? I have been inspired by Paula Emons-Fuessle's version (click here!). I loved it when she talked about Peerie Flooers on her podcast. In fact, I am loving this and so many more projects from my friend Paula's project page on Ravelry. I want to make just about everything she does. Paula really inspires me. 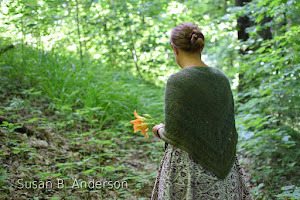 I have the yarn and patterns for all of Paula's shawl patterns, her own designs. 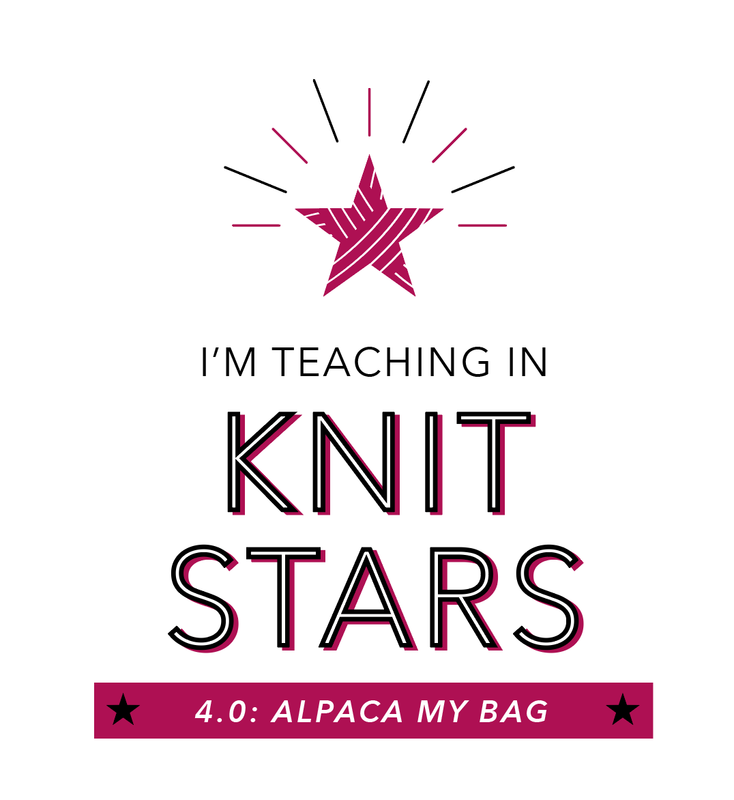 I have knit two of them already, Piper's Journey (already over 1000 completed projects in Rav) and Lullaby Rain. The others I have lined up with yarn are Gill's Rock (I have Quince & Co. Chickadee in Winesap), Ellison Bay (I have Quince & Co. Chickadee in Bird's Egg), and finally, Hyla Brook (I have Quince & Co. Tern in Sea Grass). 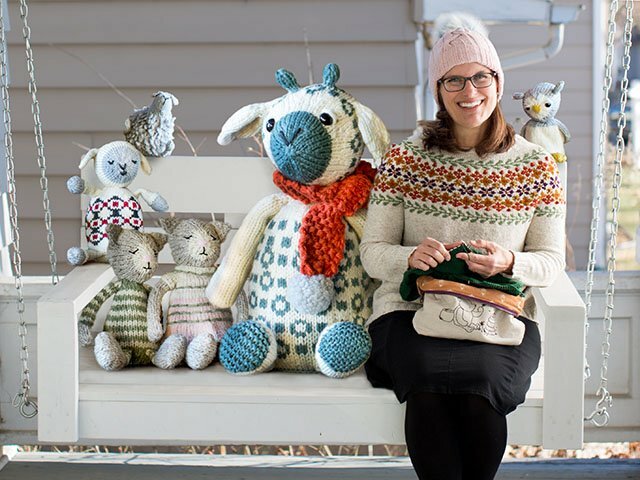 These are all going to be knit this coming winter, or shawl knitting season as I call it! You have my word. Other projects that Paula (of knittingpipeline.com) had knit that I want to knit are the Baby Tea Leaves, the Henslowe Shawl, the Holden Shawlette, Windschief and Dustland hats, and the Elowen Shawl. 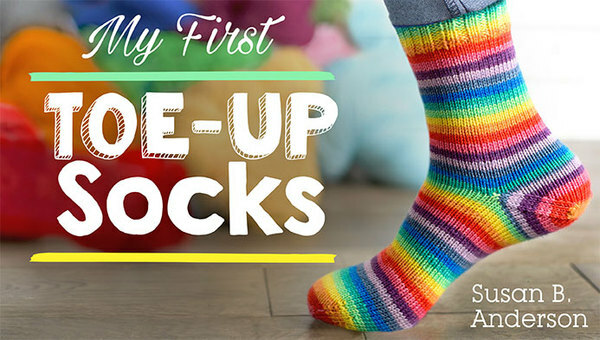 I seriously am going to knit each and every one of these projects and I can't wait. I'll share along the way! 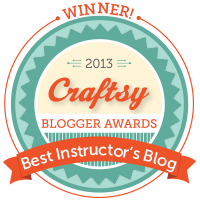 One last thing I love is the kind support you have offered by voting for me for the Craftsy's Best Instructor Blog Award. The voting is still open if you are interested. Click here to see the nominees and to vote! 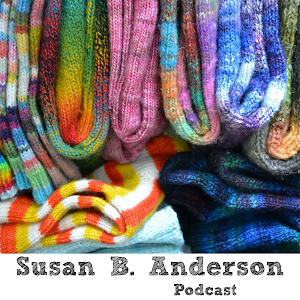 One last thing I love.... have you listened to Pam Allen and Hannah Fettig's new audio podcast, called knit.fm? They have recorded two episodes. These two knitting-greats are smart and knitterly and thoughtful. 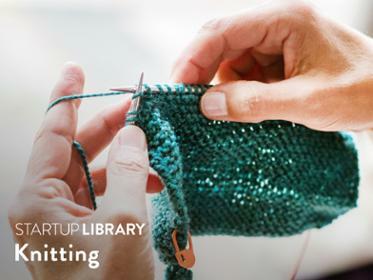 Click here to have a listen to knit.fm! Thank you so much to your RNG! I was so excited to get your pm on Ravelry! I can't wait to receive my project bag from Betz. I pre-ordered one a couple of days ago. How clever that it folds down into a bucket! The sweetest. I can't wait to receive my project bag from Betz! I pre-ordered one a couple of days ago. How clever that it folds down into a bucket! The best. okay...so.. I *get* making a bunch of cool stuff for "THE TEAM", but really, *shouldn't* THE GIRLS be the ONES "making" the hats & mitts for THEIR PARTNERS..? - It would be much more "bonding" and meaningful, don't you think? What pattern do you use for mittens? Susan, Love your blog and the hats for the Swim Sisters! All of our daughters began swimming at a very early age through high school also. Knitting is the perfect way to pass the time during those long swim meets. 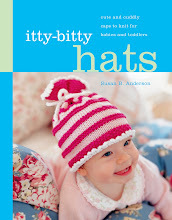 I hope you pass on the cute hat recipe-great gifts for college roommates. Happy swimming to your girls. What are their events? Our girls were mostly distance and Medley's; one solely preferred breast stroke. I, too, have Piper's Journey waiting in the wings. Other projects need finished up. Please count me in for a download copy of your "recipe". Or, simply the number of stitches that you began with for the ribbing. 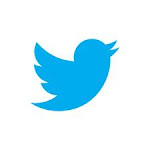 Your photos would supply the rest of the info that was needed. I love that you show your favorite things and link to the etsy shops! Sometimes etsy overwhelms me and I love your choices. Your photos tell the story for those cute swimpairs hats. Simply, what stitch count began the ribbing, and thanks again. I love the swim sisters hats. The pom poms are a perfect accent. Itsw because of you I want to put a pom pom on some of my beanies this year. I'm thinking all the girls on the swim team would love to have your daughters for their "sisters"! - great hats and mittens! And, I agree with Cindy and appreciate you sharing your Etsy finds - the bags and buttons are really fun. Oh my gosh! This is so weird/funny I am casting on this weekend the Peerie Flooers hat. I have had the yarn and the pattern for 2 years now. Good luck with yours! Love the mittens! What pattern did you use? I am also interested in what mitten pattern you used. Thanks for the new button shop. They are adorable! 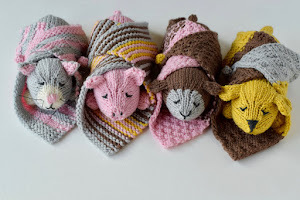 Love your creativity with the hats - especially the lime green one and would like to make it, too!